If we are to prevent future Newtown massacres, we need – as a country – to study what actually happens to human beings when they are subjected to the violence of these powerful weapons. Yet, viewing these awful photos is equally necessary if we – as a nation – decide to place some twisted notion of what the Framers intended in the Second Amendment over the bodies of these 20 first-graders and the many other victims from mass killings. 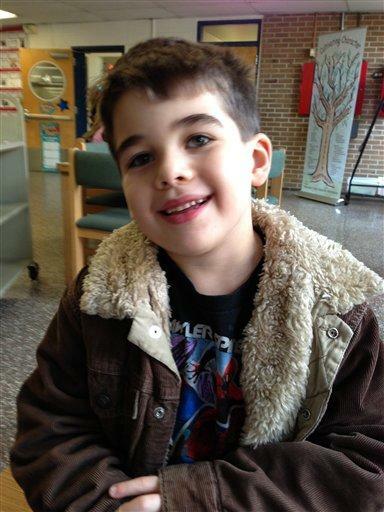 Noah Pozner, 6, one of 20 children murdered on Dec. 14, 2012, at Sandy Hook Elementary School in Newtown, Connecticut. If, after all, the “right to bear arms” is so precious, it would be even more precious after seeing the torn flesh and the fresh blood of these 20 tiny schoolchildren and their six brave teachers. Each time, these “gun rights” enthusiasts shout out their truncated version of the Second Amendment – leaving out the parts about “a well-regulated militia” and the “security of a free state” – they could have these images of mangled children flash through their minds. As painful as her message was, Pozner was right. The horrifying facts of the massacre – like the 20 children who died that day – belong to all of us since we live in a democratic Republic in which all citizens bear responsibility for the laws that do or don’t protect our society. North Dakota’s thriving state bank makes a mockery of Wall Street’s casino banking system — and that’s why financial elites want to crush it. North Dakota is the very definition of a red state. It voted 58 percent to 39 percent for Romney over Obama, and its statehouse and senate have a total of 104 Republicans and only 47 Democrats. The Republican super-majority is so conservative it recently passed the nation’s most severe anti-abortion resolution – a measure that declares a fertilized human egg has the same right to life as a fully formed person. But North Dakota is also red in another sense: it fully supports its state-owned Bank of North Dakota (BND), a socialist relic that exists nowhere else in America. Why is financial socialism still alive in North Dakota? Why haven’t the North Dakotan free-market crusaders slain it dead? In 1919, the Non-Partisan League, a vibrant populist organization, won a majority in the legislature and voted the bank into existence. The goal was to free North Dakota farmers from impoverishing debt dependence on the big banks in the Twin Cities, Chicago and New York. More than 90 years later, this state-owned bank is thriving as it helps the state’s community banks, businesses, consumers and students obtain loans at reasonable rates. It also delivers a handsome profit to its owners — the 700,000 residents of North Dakota. In 2011, the BND provided more than $70 million to the state’s coffers. Extrapolate that profit-per-person to a big state like California and you’re looking at an extra $3.8 billion a year in state revenues that could be used to fund education and infrastructure. Each time we pay our state and local taxes — and all manner of fees — the state deposits those revenues in a bank. If you’re in any state but North Dakota, nearly all of these deposits end up in Wall Street’s too-big to-fail banks, because those banks are the only entities large enough to handle the load. The vast majority of the nation’s 7,000 community banks are too small to provide the array of cash management services that state and local governments require. We’re talking big bucks; at least $1 trillion of our local tax dollars find their way to Wall Street banks, according Marc Armstrong, executive director of the Public Banking Institute. So, not only are we, as taxpayers[1. Editor’s Note: And now, as depositors too. See “It Can Happen Here: The Confiscation Scheme Planned for US and UK Depositors“], on the hook for too-big-to-fail Wall Street banks, but we also end up giving our tax dollars to these same banks each and every time we pay a sales tax or property tax or buy a fishing license. In North Dakota, however, all that public revenue runs through its public state bank, which in turn reinvests in the state’s small businesses and public infrastructure via partnerships with 80 small community banks. Banks are supposed to serve as intermediaries that turn our savings and checking deposits into productive loans to businesses and consumers. That’s how jobs are supported and created. But the BND, a state agency, goes one step further. Through its Partnership in Assisting Community Expansion, for example, it provides loans at below-market interest rates to businesses if and only if those businesses create at least one job for every $100,000 loaned. If the $1 trillion that now flows to Wall Street instead were deposited in public state banks in all 50 states using this same approach, up to 10 million new jobs could be created. That would effectively end our destructive unemployment crisis. We’re a fairly conservative lot up here in the upper Midwest and we didn’t do any subprime lending and we have the ability to get into the derivatives markets and put on swaps and callers and caps and credit default swaps and just chose not to do it, really chose a Warren Buffett mentality—if we don’t understand it, we’re not going to jump into it. And so we’ve avoided all those pitfalls. As state government employees, BND executives have no incentive to gamble their way toward enormous pay packages. As you can see, the top six BND officers earn a good living, but on Wall Street, cooks and chauffeurs earn more. As you can well imagine, our financial elites would love to see this successful (socialist!) bank disappear. Its salary structure and local investments makes a mockery of Wall Street’s casino banking system. But the bigger threat comes from the possible spread of this public banking concept to other states. Already, there are 20 or so state legislatures that are exploring state banks. Collectively, more public banks would pose an enormous threat to the $1 trillion in state and local bank deposits that now run through Wall Street. But elite financiers also stand to lose much more. In the 49 states without a public bank, there’s no safe place to turn for loans to rebuild schools and finance other public infrastructure projects. That creates an enormous opportunity for Wall Street firms to hook localities on expensive bond programs — like capital appreciation bonds, which can lead to repayments equaling 10 times the original loan. Investment bankers and advisers also make enormous fees by selling expensive, high-risk financial schemes to state and local governments (read an investigative report here). But such schemes are useless in North Dakota where the state bank provides the capital the state needs for a fraction of the long-term costs. Depending on the final language, it is possible that the activities of the Bank of North Dakota could be ruled illegal because “foreign bankers could claim the BND stops them from lending to commercial banks throughout the state,” according to an analysis by Sam Knight in Truthout. How perfect for Wall Street: a foreign bank can be used as a shill to knock out the BND. A small but highly dedicated group of financial writers, public finance experts and former bankers have formed the Public Bank Institute to spread the word. Working on a shoestring budget, its president Ellen Brown (author of Web of Debt), and its executive director Marc Armstrong, a former wholesale banker, have become the Johnny Appleseeds of public banking, hopping from state to state to encourage legislatures to explore state-owned banks. The movement is gathering steam as it holds a major conference on June 2-4 at Dominican University in San Rafael, CA featuring such anti-Wall Street hell raisers as Matt Taibbi and Gar Alperowitz, along with Brigitte Jonsdottir, a member of the Icelandic parliament, and Ellen Brown. Is America Up For This Fight? Since the crash, the financial community has largely managed to wriggle off the hook. In fact, fatalism may be replacing activism as we sense that maybe Wall Street is simply too big and too powerful to change. After all, the big banks seem to own Washington, as too-big-to-fail banks are permitted to grow even larger and more invulnerable to prosecution and control. But this new public banking movement could have legs, especially if it teams up with those fighting for a financial transaction tax (see National Nurses United.) Most Americans remain furious about how financial elites profited from the crisis — before, during and after — while the rest of us pick up the tab. Americans know deep down that Wall Street is the predator and we are the prey. The state-owned and operated Bank of North Dakota proves that it doesn’t have to be that way. This is the time to fight for public state banking in a big way. In the sphere of the Internet, Banville observes, there are about four titanic “gatekeepers:” Google, Amazon, Facebook and Apple (iTunes). Most of those gatekeepers have various ways to make money. Banville, in this short video, explains why Facebook has only one way to make money, and why, since it went public, it will be under continuing pressure to increase its profit year after year. Jonathan Ginsberg posted an interesting article on the National Association of Chapter 13 trustees web site this weekend, that will be relevant to many of our readers as well. Social security is now requiring all beneficiaries to set up direct deposit, which means the resulted funds could become available to executing creditors if there are any funds from any other source in the account as well. You might recall my blog about this some time back, which contains cites to some of the relevant law. As my previous blog explains, Federal law provides that Social Security payments are exempt from garnishment from civil creditors. If, for example, a credit card lender sues you and obtains a judgment, that creditor cannot ask Social Security to withhold funds from your government check. While these protections do not apply with equal force to the IRS collecting a tax debt or a creditor collecting child support, all other creditors are not to touch social security funds under any circumstances. “Social Security recipients can protect themselves by asking their bank to create a sub-account that holds onl y SSA issued funds. No money other than SSA funds should ever be deposited into this account. This is especially necessary if the recipient has civil judgment creditors looking for a source of funds to levy against. In my practice, I have represented a number of senior citizen clients who are living with tens of thousands of dollars in credit card debt, have no assets or equity in property, and who survive on Social Security only. In these cases I often discourage bankruptcy and instead write each creditor advising the creditor that my client is judgment proof with no source of funds that can be garnished. At the same time I write the credit card company, I also draft a letter to my client’s bank, putting the bank on notice that it should not honor any garnishment because the sole source of funds is Social Security money. Often, however, I find that my clients are using their “Social Security” account as a regular bank account and they deposit other money, such as funds generated from a garage sale or a gift from a relative. I spend a lot of time explaining to my client that even a few dollars of co-mingled money may jeopardize the protected status of their Social Security bank account. Nathalie Martin joined the University of New Mexico law faculty in 1998. Her research focuses on consumer law and bankruptcy, as well as elder law. Most recently, she has studied predatory lending products such as payday loans and title loans, as well as products and services offered to the elderly. Her projects include several empirical studies funded by the National Conference of Bankruptcy Judges, including one that funded curbside interviews of payday loan customers and an ongoing study of the credit habits of undocumented New Mexicans. The author of several books and dozens of law review articles, she holds what is thought to be the only endowed chair in the country dedicated to consumer law issues. In Phoenix, you don’t ask: What could go wrong? You ask: What couldn’t. Phoenix’s pyramid of complexities looks shakier than most because it stands squarely in the crosshairs of climate change. The area, like much of the restof the American Southwest, is already hot and dry; it’s getting ever hotter and drier, and is increasingly battered by powerful storms. Sandy and Katrina previewed how coastal cities can expect to fare as seas rise and storms strengthen. Phoenix pulls back the curtain on the future of inland empires. If you want a taste of the brutal new climate to come, the place to look is where that climate is already harsh, and growing more so — the aptly named Valley of the Sun. Every system, like every city, has its vulnerabilities. Climate change, in almost every instance, will worsen them. The beefed-up, juiced-up, greenhouse-gassed, overheated weather of the future will give us haboobsof a sort we can’t yet imagine, packed with ever greater amounts of energy. In all likelihood, the emergence of such storms as a feature of Phoenix life results from an overheating environment, abetted by the loose sand and dust of abandoned farmland (which dried up when water was diverted to the city’s growing subdivisions). Phoenicians who want to escape water worries, heat waves, and haboobshave traditionally sought refuge in the cool green forests of Arizona’s uplands, or at least they did until recently. In 2002, the Rodeo-Chediski fire consumed 469,000 acres of pine and mixed conifer on the Mogollon Rim, not far from Phoenix. It was an ecological holocaust that no one expected to see surpassed. Only nine years later, in 2011, the Wallow fire picked up the torch, so to speak, and burned across the Rim all the way to the New Mexico border and beyond, topping out at 538,000 charred acres. Based on a popular Mother Jones post on inequality. Who’s Behind the Effort to Destroy the US Postal Service, a Fundamentally Sound Business? That 75-year pre-funding mandate adds substantially to the post office’s losses. This is a requirement that no other government agency, let alone a private company, must face. In short, the USPS is paying for people who aren’t even employees yet — in fact, may not even be born yet! And the USPS has been a model for prudent squirreling. As of Feb. 2012, it had more than $326 billion in assets in its retirement fund, good for covering 91% of future pension and health-care liabilities. In fact, on its pensions, the USPS is more than 100% funded, compared to 42% at the government and 80% at the average Fortune 1000 company. In health-care pre-funding, the USPS stands at 49%, which sounds not so good until you understand that the government doesn’t pre-fund at all and that just 38% of Fortune 1000 companies do, at just a median 37% rate. The USPS does better than almost everyone. So, if USPS is just government bloat, as some ideologues would have it, then why would efficient free market players such as UPS and FedEx resort to the government? Shouldn’t they simply compete USPS out of that express business? This paradox reveals in stark detail the industry’s game plan. Compete effectively where possible and then use political power to grab market share from USPS, with the ultimate goal of privatizing the postal system, or at least its profitable parts. This goal is emblematized by the Cato Institute, a Washington think tank founded by Charles Koch advocating the privatization of public services such as the post office. Frederick W. Smith, founder and CEO of FedEx, was on Cato’s board, and FedEx funds Cato. The results of this game plan are well-documented and disastrous for citizens. Want to know what will go down if the postal service is privatized? (Not postage!) Take a look at the 2008 Chicago parking meter fiasco, where the city leased its meters for 75 years to an investor group. The city gave the concession while estimating lifetime revenue at just half what investors expected. Now 2013 marks the fifth year in a row that meter prices have gone up, and Chicago boasts the highest prices in the U.S. The final middle finger: Whenever the city closes streets (as for a parade), it has to pay investors the lost meter revenue. Expect the same for postage rates and with reduced service. I’ve never seen anything like this report from CBS‘s 60 Minutes last night, on the Chinese real estate bubble. What will be the impact on the global economy when this bubble bursts, as all bubbles must?